Birth injuries are sustained during difficult deliveries. Several types of birth injuries exist: brain injuries, nerve injuries and physical injuries. While in some cases, birth injuries are temporary, in other situations, they are permanent. Birth injury symptoms can be mild in some infants and severe in others. For every 1,000 infants born in the United States, six to eight of them are born with a birth injury. Annually, 28,000 newborns are born with a birth injury. This translates into 2,333 monthly, 538 weekly and 76 daily. Some of the most common birth injuries include: brachial plexus palsy, or Erb’s Palsy; cerebral palsy; perinatal asphyxia; bone fractures; facial paralysis; spinal cord injuries; and intracranial hemorrhage. Nearly 50 percent of all birth injuries can possibly be avoided by recognizing obstetrical risk factors and planning for them. Pennsylvania families facing this misfortune have experienced advocates available at the Philadelphia medical malpractice law firm of Silvers, Langsam & Weitzman, P.C. Contact our attorneys for a free consultation on how we may help you recover compensation when hospital negligence contributed to your baby’s birth injury. Approximately 76 birth injuries occur daily. Birth injuries are more common in young mothers and those whose physicians use birthing tools. Does the mother’s age affect birth injury rates? Birth injuries are more prevalent among mothers ages 25 to 34 whose physicians used birthing tools like a vacuum or forceps. They occur least frequently in mothers who range in age of 40 to 54. However, the birth injuries in mothers who delivered babies vaginally without the use of instruments is only high for those ages 25 to 29. Our Philadelphia birth injury lawyers offer strong and compassionate representation when acts of negligence have harmed your baby’s health. We have the experience and resources to uncover the truth and get your family the compensation you need to cope with your baby’s birth injury. Birth injuries can manifest in various ways. Brain injuries frequently arise as a result of oxygen deprivation. Such injuries include anoxia, hypoxia, birth asphyxia and perinatal asphyxia. Hypoxic Ischemic Encephalopathy (HIE) is a birth injury, which can result in serious consequences, and it is marked by starvation of the brain of oxygen. When there is an interruption of oxygen flow to the brain, brain ischemia can result. This is a type of stroke, where the brain responds by draining the blood from the brain, causing brain damage. On the other hand, a brain hemorrhage occurs when the brain responds to an inordinate amount of blood flow to the brain. When the brain responds to oxygen deprivation, additional electrical responses occur, causing brain damage from seizures, or causing further electrical disorders. 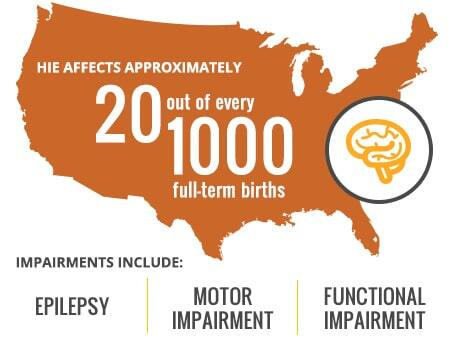 Brain-related injuries in newborns can also occur as a result of other birth injuries. This includes the development of jaundice into kernicterus, in which the brain is deluged with bilrubin, and the development of the “group B strep infection,” a bacterial infection, into meningitis, which causes interference of the electrical communications between the spine and the brain. 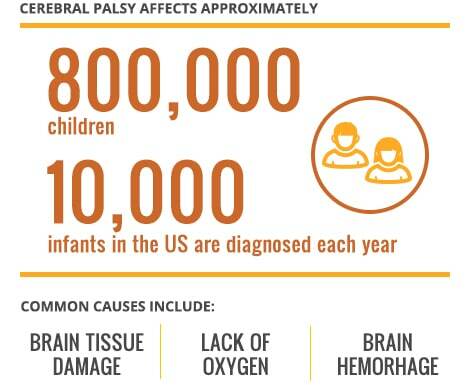 Cerebral palsy (CP) is the leading brain-related injury that is relevant to birth trauma, and it impacts approximately 800,000 children. This condition can develop following maternal infections, loss of oxygen, infant stroke and infant infection. Cerebral palsy can be prevented in some cases if the treating doctor takes corrective steps. Cerebral palsy is frequently misunderstood to be a birth injury that is associated with muscles because in some instances the infant experiences a complete loss of muscle control. However, cerebral palsy is a birth injury that is associated with the brain, and impacts the way in which the brain transmits signals to muscle groups. Injuries associated with muscles are usually easy to diagnose inasmuch as a clinical evaluation can determine the point at which the limited movement or paralysis originates. Some muscle-related injuries may be linked to more conspicuous examples of medical malpractice, including, but not limited to, lacerations, bruises or broken bones. As a result, other physical birth injuries may develop, such as skull fractures or cephalohematoma, which is marked by a bruising of the area between the brain and the outer layers of skin. Following are some of the typical birth injuries related to muscles. A brachial plexus injury can be caused by difficulties during a breech birth or force applied to the neck from pulling, among other things. A brachial plexus injury is most frequently caused by a difficult delivery. During delivery, if the baby was large and its head was slanted to permit the shoulders to pass through the birth canal, a brachial plexus injury may result. If any force is applied, or if doctors pull too hard on the baby, the baby’s nerve fibers can become injured or bruised. As a result, the muscles that are activated by those nerves may become weak or unable to function. The brachial plexus is composed of five nerves, which are fibers that transmit electrical messages from the brain to the muscles. The brachial plexus nerves begin in the spinal cord and extend out from the neck to the muscles and tissues down the arms. These nerves give motion and sensation to the shoulders, arms and hands. Nerves usually repair themselves at a rate of approximately 1mm per day or 1 inch per month, a process that can take several months. However, if the nerve has been cut, it is unable to repair itself and the muscle will not function. A form of brachial plexus injury is Erb’s palsy, which is a condition in which the arm is weak or paralyzed. It impacts voluntary motion in the upper arm and rotation in the lower arm. Erb’s palsy frequently occurs in an abnormal or difficult childbirth. 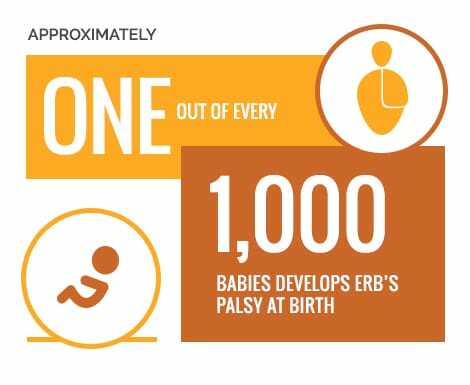 One out of every 1,000 babies develops Erb’s palsy at birth. This injury is usually caused by the stretching of the baby’s neck to one side during birth, thus giving rise to temporary or permanent nerve damage. Based on the seriousness of the condition, the paralysis may end after some months have elapsed, or there may be a need for additional treatment, including therapy and/or surgery. Since Erb’s palsy is caused by nerve damage during birth, its symptoms are immediately identifiable at birth. However, a diagnosis regarding the seriousness of the nerve damage and restricted mobility may not be possible until three to six months following delivery. The paralysis can range from partial to complete lack of mobility, and nerve damage can consist of minor bruising or full tears. Shoulder dystocia is a birth injury in which a baby’s shoulders become trapped in the mother’s birth canal at the time of delivery. There is a risk that the child will become permanently disabled or die in the most serious cases. Complications during birth can affect both the mother and child. How often does shoulder dystocia occur? Fortunately, shoulder dystocia only happened in a small percentage of births, and very few of those cases are characterized by permanent injuries. The frequency with which shoulder dystocia occurs varies, depending on the weight of the baby. In 0.6 to 1.4 percent of all babies weighing between 2,500g and 4,000g (5lb. 8oz, to 8lb. 13oz) shoulder dystocia can occur. The rate rises to 5 to 9 percent among newborns with a weight between 4000g to 4,500g (9 1b. to 14 oz) born to mothers who have diabetes. 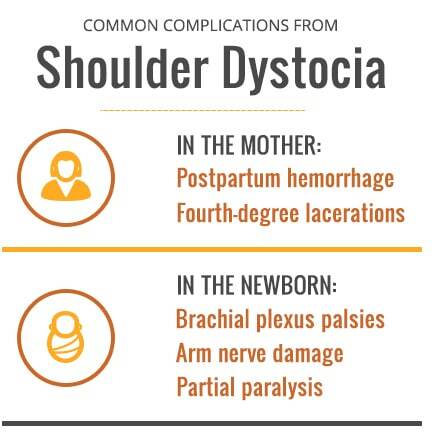 Complications resulting from shoulder dystocia during delivery can affect both the mother and they baby. The most common maternal complications are postpartum hemorrhage, which occurs in 11 percent of cases, and fourth-degree lacerations, which happen in 3.8 percent of cases. The most typical fetal complications are brachial plexus palsies, which occur in four to 15 percent of infants. Almost all palsies heal within six to 12 months, with fewer than 10 percent developing into permanent injuries. Risk factors include diabetes in the mother, abnormal pelvic anatomy and the use of tools during delivery. Birth injuries often result from prolonged labor and, in some instances, medical negligence. Such medical errors can occur in vaginal deliveries in which the doctor uses forceps or a vacuum. However, they can also occur as a result of a doctor’s failure to identify and sufficiently correct any complications that may arise in the process of delivery. If a doctor is lacking in adequate training or neglects to follow generally accepted standards of care, any mistakes that are committed may form the basis of a medical malpractice lawsuit. The birth injury attorneys at MyPhillyLawyer can provide an assessment of your case in order to discover whether your doctor or hospital was negligent during the pregnancy and delivery. They can obtain the compensation you require to provide care for your child.